not to worry if you drop something on the floor. Pop it back into the pan and no one will ever know the difference. A of couple pictures in one of her cookbooks show desserts that are a bit crispy around the edges, which wouldn’t stop me from eating them. The first time I had this week’s recipe, I was in England at a summer party. 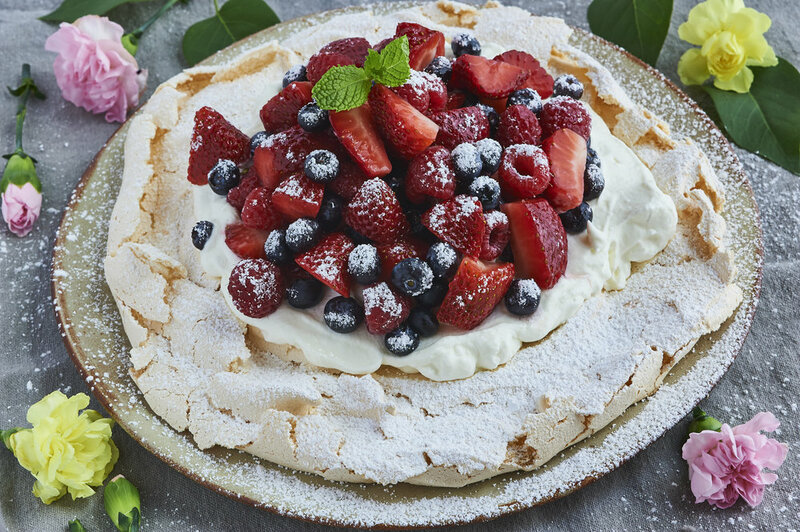 I am not a big fan of meringue but I love this recipe. 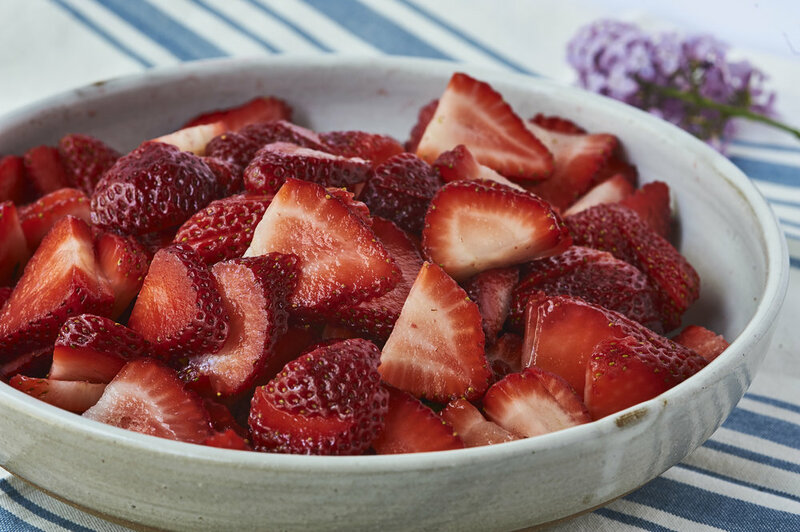 It is the perfect dessert any time of year but especially in the summer because there are so many fruit options, and as desserts go, this is light and satisfying. The meringue is crunchy and chewy; at the same time you get a taste of juicy fruit and whipped cream. The hard part about making this is letting go of your picture of Mary Berry’s meringue. It may come out of the oven picture perfect, but as it starts to cool, it can crack and droop. Don’t worry—this dessert is very forgiving, because you can cover up the cracks with whipped cream, fruit, and powdered sugar. No one will notice, I promise. They will be too busy eating. sides of the cake to glue the whole thing together. Instead, the weight of the frosting tore the cake into three big chunks that fell on to the kitchen counter along with part of the bottom layer. We all had a bite or two that night. It didn’t taste that bad; it just didn’t look very appetizing. On a sheet of parchment paper, trace or draw a 10 inch circle. Turn the paper over so the circle is visible and place it on your baking sheet. Set aside. In the bowl of an electric mixer beat the egg whites. When they start forming soft peaks, it is time to add the sugar a tablespoon at a time. Beat until the whites are glossy and very stiff (about 5 minutes). If you can hold the bowl upside down and the egg whites don’t move it is ready. Next sprinkle the vinegar and cornstarch over the top of the meringue and gently fold it in until combined. Spoon the meringue onto the parchment paper spreading it around until you get it just inside your circle. Using the back of the spoon make a slight indentation in the middle for the berries. Keep in mind that the meringue will change shape as it cools so don’t make the indentation too deep. Place it in the oven and immediately turn the temperature down to 300°. Bake for one hour. Turn off the oven and leave the meringue in the oven to cool. Once cool you can move it carefully to a platter and decorate. Using the whisk attachment whip the heavy cream until it is thick. Carefully spoon it on to you base, billowing it over the top of your indentation. Starting with the strawberries, place the fruit a piece or two at a time on the pavlova spreading it around evenly. Repeat with the blueberries and finally the raspberries. Sprinkle the powdered sugar over the top and serve. on the fruit: peaches and raspberries (a favorite fruit combination of mine), plums, and blueberries, mangoes and strawberries, or another fruit of your choice. You can also use sorbet instead of cream, or even drizzle some melted chocolate over the top.